Africa, 1944. Join Professor Pack on the ultimate jewel matching adventure across the world's richest continent. 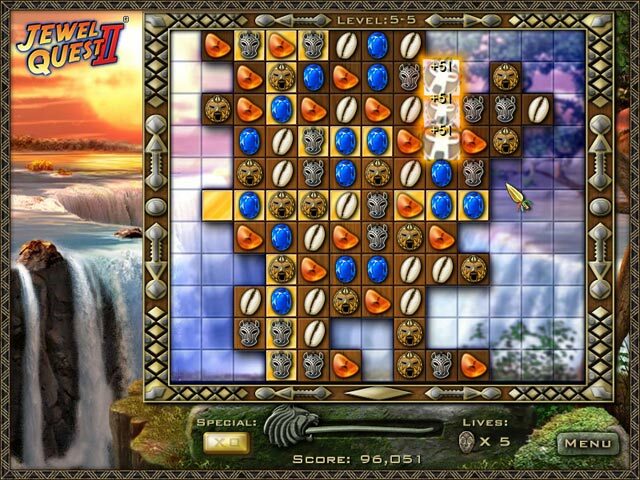 Rearrange precious relics to turn tiles into gold as you advance through relentlessly challenging puzzles. The wilds of the safari, the history of the Zimbabwe ruins, and the majesty of Victoria Falls await your discovery. 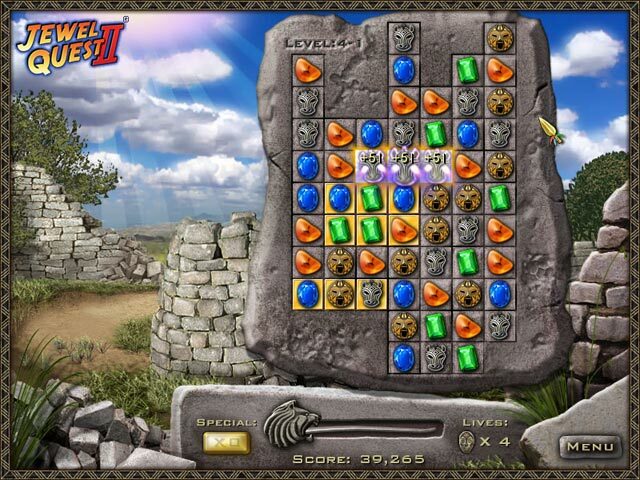 Filled with puzzles of skill, treasure, and twists, Jewel Quest 2 is the adventure you've been waiting for. 9 new jewels and power-ups. 5 skill levels to master. Jewel Quest II is rated 4.0 out of 5 by 21. Rated 5 out of 5 by Dasha501 from My favorite match three and puzzle game This game gives hours of fun and is not a quick run through like some of them. I am stuck on level 3-6 if anyone has suggestions. There are truly some puzzles that take some strategy and thinking. Rated 4 out of 5 by mrm2006 from A broken heart turns into a man at sea. A scholar and gentleman has lost his heart to a girl named Emma, who has chosen an heir instead of him. In dismay, and too old to join the Navy, he becomes indentured on a mariner going to Africa. He is scorned by his sea mates, except for one named Hani who tells him tales - but only at the completion of each gem board level - so the story continues between each level. I found the story confusing, as it starts out as noted above, but then relates how grateful he is for the Captain''s leniency in letting him leave the ship early. But, then, discounts how he is fearful of asking the Captain just that....hm. Also, the story is shown on pieces of a map but then jumps to a page in a journal then back again...another hm. Otherwise, it's a typical match 3 game. There are no bonuses for making 4 or more matches. But, periodically, coins will show up on the board. Match 3 to get a "special", which is basically a bonus that allows you to destroy one file on the game board. Collect as many of those "specials" as you can because they will come in handy when time is running out and you have a corner or difficult space you can't clear. If not for the confusing storyline, I probably would have given this game 5 stars. But, I rate story lines high on my list. Especially in a good match 3 game. I will encourage everyone to try it before you buy it. Maybe the inconsistencies won't bother you as much as they did me. Happy Gaming! Rated 4 out of 5 by jankles from Not that old nasty timer again When will the developers of these games learn to make it with and without the timer. There are some of us that are a lot slower than the young people. You hate to buy a game you never can finish. I would love this game but even before the trial ran out I almost lost my time so its a no buy for me. Why can't the developers take some of these time games and go back into them and change it, really don't know if that can be done, but a lot more people would buy. Rated 4 out of 5 by ComfyMom from The variety of board styles is great I really liked this game. It kept me entertained for hours and hours while visiting family for a week. Lots of different styles made for enjoyable play time. Rated 3 out of 5 by Cherubabies from NO Untimed Option AGAIN! Would have given it a much higher score if it wasn't for those stupid COINS always getting in the way and blocking you! And why no untimed option? Something to play on a raining day with my Free Game Coupon but I would never pay for this Game! Rated 3 out of 5 by charlene_lane from Not bad, but know they do better in the future This is the second game in the Jewel Quest series, which includes Quest and Tournament modes. Overall, I found this game a bit monotonous as you are playing the same boards over and over again, with slight deviations [eg monkeys, gold coins, etc]. To actually move around the board feels clunky. Instead of just sliding around the board, you actually have to click twice to move anything - got on my nerves after a while. Once you reach 99 specials and 20 lives, unfortunately that's where you stay, although your total points do go up. I found that out on Level 2. I've finished this game now, however I don't think I will play it again. However, I have played the later Jewel Quest games numerous times. This is a very easy game to play and therefore would be perfect for a new or intermediate player who wants to get the experience. I have played all the other Jewel Quest games and know that they do get a lot better than this - in both story line and graphics. Rated 2 out of 5 by bessiegirl from Old school match 3 Started level 1 of the demo and realized there is no option to play untimed, but the one thing that turned me away immediately is you can't make a move until the game stops dropping jewels...meaning the timer is going and you have to sit and wait for your last move to complete. Frustrating and annoying....sorry, no buy. Rated 2 out of 5 by arnold1049 from NOT ENOUGH "LIFE" IN THIS GAME This game is a basic Match 3 with a storyline that is used to transition between scenes. At the beginning, you are given 3 (?) lives. If you do not finish a game within the time frame allowed, you lose a life. You can earn additional lives by accumulating points, with a life added for every 50,000 points. There is no untimed option available. Once you run out of lives, which was pretty quickly for me, the only alternative was to start the game over from the beginning. I am not a fast player but I would say I'm about average. I ran out of lives after only a few grids, so this game ended up being extremely short and frustrating. Start back at the very beginning? I have better things to do and better games to play than to play this one over and over again. Thankfully the games later in this series removes this limitation and are much more enjoyable. Rated 2 out of 5 by springiscoming from hate to dble click I like this game. I just dont like to have to double click to move a gem. Most frustrating. Fix that...I just might buy the game. Rated 1 out of 5 by crimsoncrab from Too slow, too monotonous, too everything! 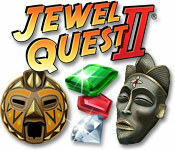 This is the second game in the Jewel Quest series, which includes Quest and Tournament modes. Overall, I found this game a bit monotonous as you are playing the same boards over and over again, with slight variations. To actually move around the board feels clunky. Instead of just sliding around the board, you actually have to click twice to move anything - very slow too! In the initial trial period I don't think I was aware of the fact that it is a timed game. I really don't care for timed games and this one is an example of why: the work required is greater than the time allowed unless you can move at the speed of light. 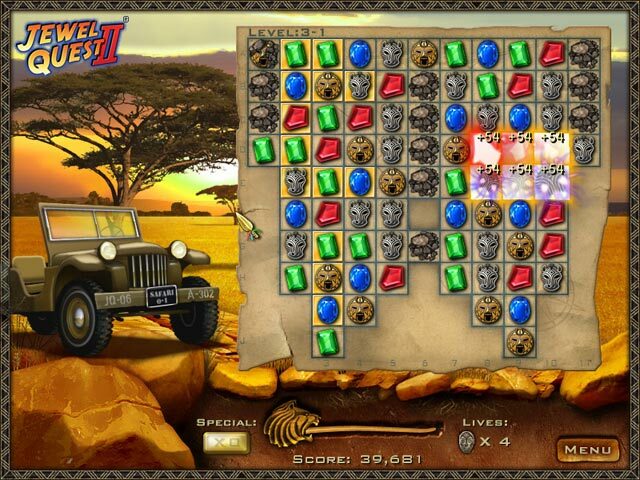 Play the ultimate jewel matching adventure; turn precious relics to gold! Match wisely, and you’ll unveil the treasures of Africa!